SHIPPING FROM EU, NOW ALSO IN KIT FORM!! Looking for a solution giving gain similar to 2 bay vertical dipoles with perfect omnidirectional coverage and have some space available at the top of a roof or a tower? Than this is the antenna for you. 2-dipoles mounted at the side of the tower will not give perfect omni-directional coverage; this antenna at the top of a tower will. Produced to exacting standards using state of the art electrical and mechanical designs resulting in superior performance and long service life. 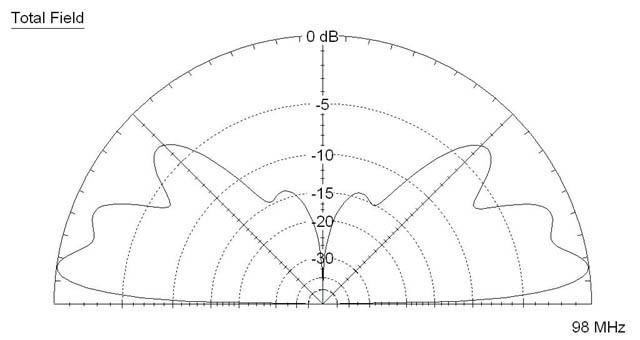 When measured against a standard 1/2 wave dipole the ExterminatorII® delivers a massive 5.15 dBi gain across the entire FM Band. 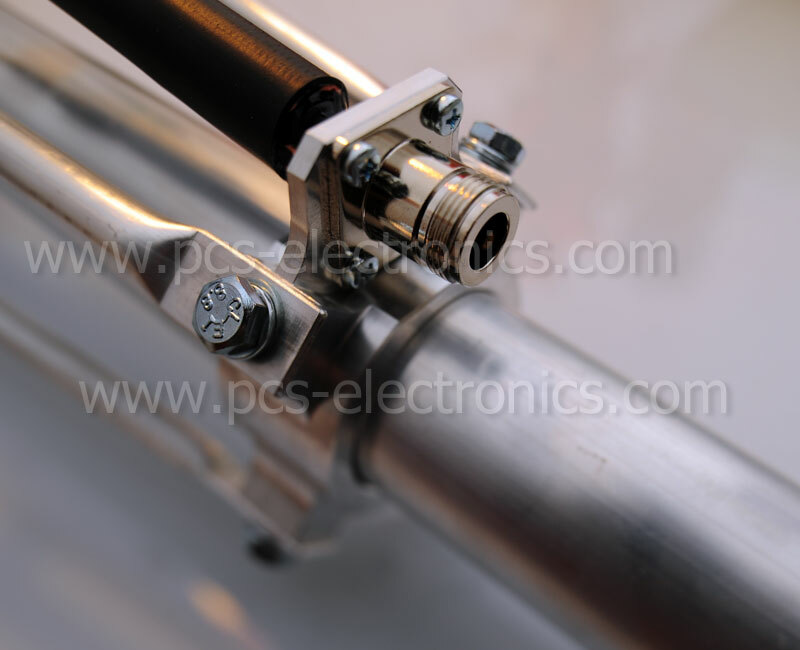 All RF connectors are teflon components with specifications that exceed required ratings. Antenna arrives fully tuned and assembled the ExterminatorII can be installed on your tower or mast in a matter of minutes. Remember to write your desired frequency during check-out under comments, we will tune your antenna for you. You can always tune your antenna alone with SWR meter and instructions. Note that although antenna is tuned at the factory it is sometimes necessary to make a small adjustment depending on for example nearby objects etc. Some parts may also move slightly during shipping so remember to re-tighten all screws. 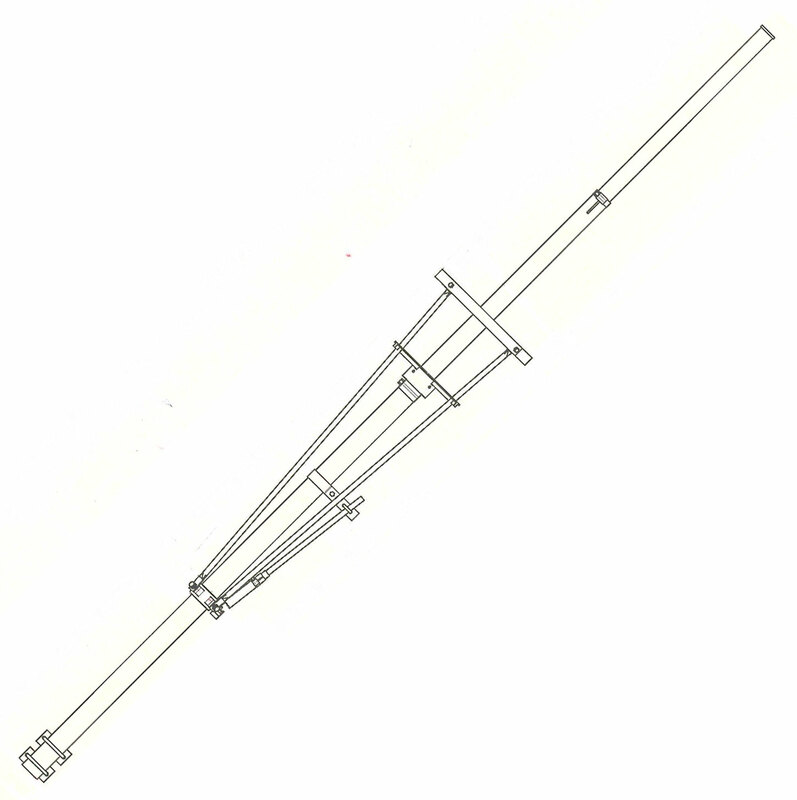 Antenna ships in fully assembled form, but the two sections are collapsed for easy transport. You will only have to release two screws and extend the two telescopic sections all the way to the two black marker circles, than fix the screws again. - Perfectly circular coverage when mounted on top of a tower/pole. How much ERP will my transmitter have with this antenna? What is included in KIT version? Although antenna comes pre-tuned it is recommended that you re-check the SWR before putting antenna into service, nearby objects can slightly de-tune the antenna! 1. 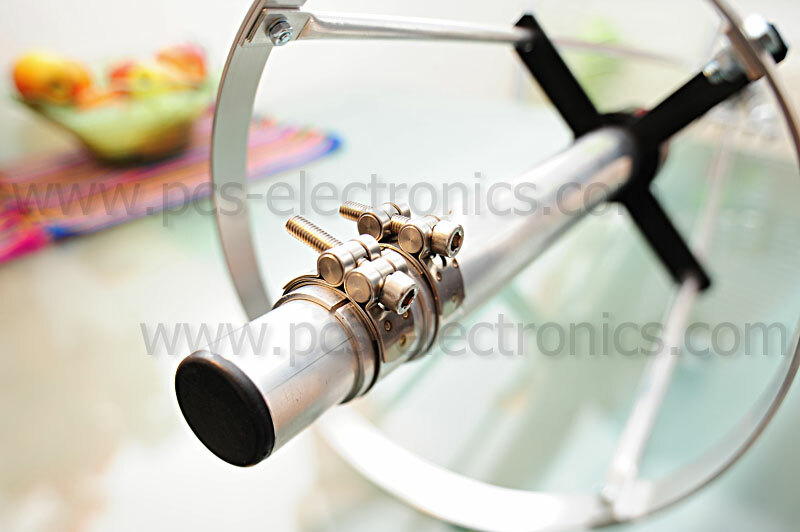 If you received your antenna pretuned extend the two telescopic sections until the two black marker rings show. 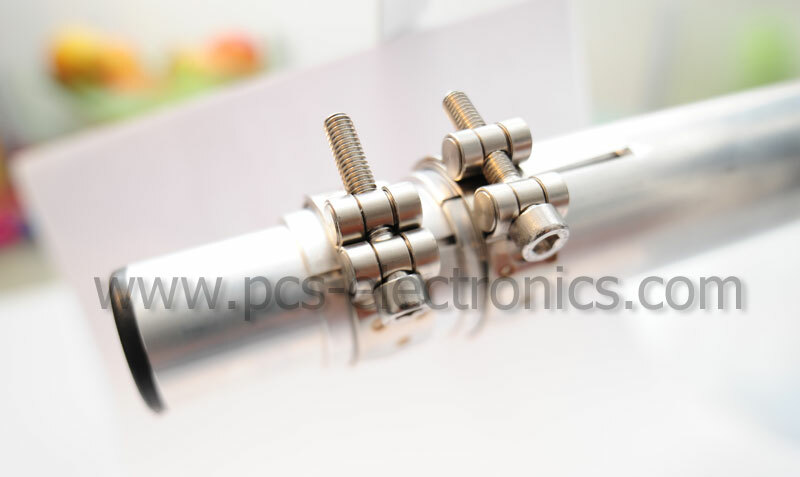 If you are retuning to another frequency extend the antenna as shown below (loosen screws and extend the 2 telescopic parts). 3. If you received antenna pretuned, do not loosen gamma rod. If this is a new untuned antenna or if you are re-tuning loosen the gamma strap so that the gamma rod can move in and out with a bit of effort. Now set the rod so that it is about 1/3 in the black gamma match tube. 4. Connect RigExpert SWR analyzer (AA-170 or better), power it up, press 4 for SWR measurement. (read the PS below if you do not own one). PS: If you don't have antenna analyser feel free to use SWR meter as well, however do this at minimal power that still makes it possible to get a decent reading out of your SWR meter and at the same time does not endanger the output stage of your transmitter. Never read SWR off the LCD display of your transmitter, USE A REAL SWR meter or antenna analyser. Important: Due to large size and irregular shape of these packages the website often gets shipping cost wrong. Also sometimes we have to use wooden case which adds about 100 euro to the cost of antenna. For exact shipping cost please contact our sales department, be sure to give them your exact address and they will quote you shipping. Recommended accesories: Grounding kits can be purchased here, they ensure lightning protection. They should be installed at the antenna, at the tower base and at the point of entrance into transmitter building. 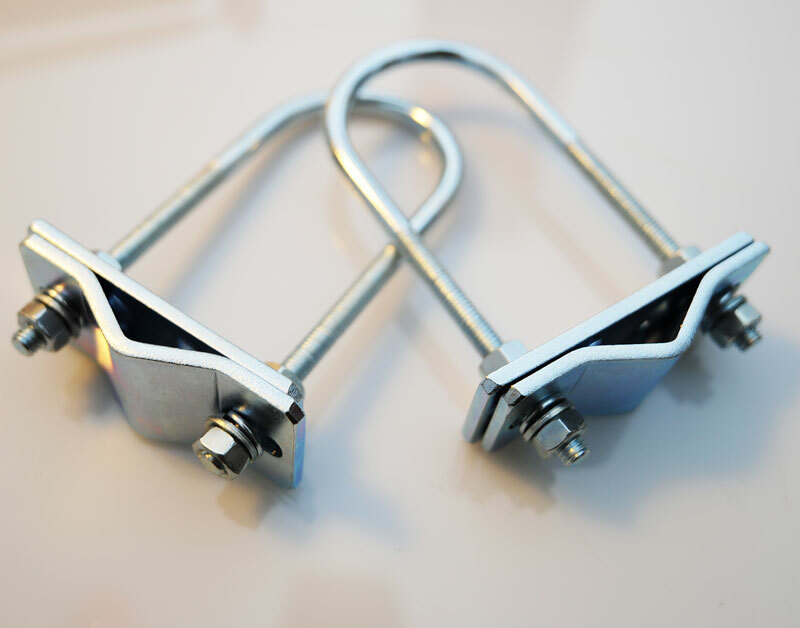 Also use self-sealing tape on connectors, it fuses into rubber and protects moisture from entering your coaxial cable and antenna system. There are several similar designs out there, all based on the old SIRIO design. Most of those use very poor gamma match from the CB-radio version which blows very fast. Those also use cheap plastic connectors. Pretty much all of them use low-cost cast heads. Ours is the only version which comes with high-grade CNC machined head. Check the photos. Some of the guys who sell these antennas also claim that they invented them even though the antennas are identical to the old SIRIO design. Ask these guys for patent number and see them strugle.